Uh-oh. 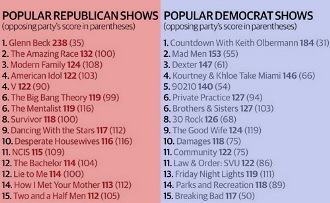 TV Squad has the contemporary political equivalent of the long-stemming left brain-right brain debate: a chart of the most popular Republican and Democratic television shows (with the opposing party’s strangely proportional tally in parentheses!). Based on a new study by Experian Simmons, the results situate the Grand Old Party on the couch in front of populist-charting favorites such as American Idol and Dancing with the Stars, while the lefties decompress with Law and Order: SVU and Mad Men. Chart toppers? Op-ed news network programming faves Glenn Beck and Keith Olbermann, rather unsurprisingly. Nearly twenty-five years ago, public opinion studies pioneers Shanto Iyengar and Donald R. Kinder first published News that Matters: Television and American Opinion. Just released in an updated edition, the book was the first to document a series of sophisticated and innovative experiments that demonstrated how the order and emphasis of news stories varied in selected television broadcasts. 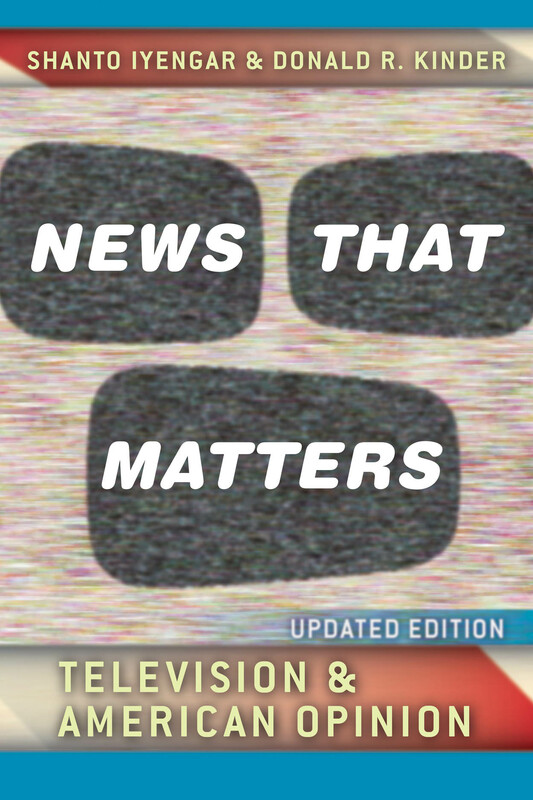 Now hailed as a political science classic, News that Matters, Updated Edition (with a new preface and epilogue, and available as an ebook) shows how and why extended coverage in the national news and broadcast television causes matters to gain or lose credibility, as criteria for everything from evaluating the sitting president to prioritizing issues on the ballot. Taking all of this in light of the Experian Simmons survey, I think we can say News that Matters does matter: careful what you tune into!